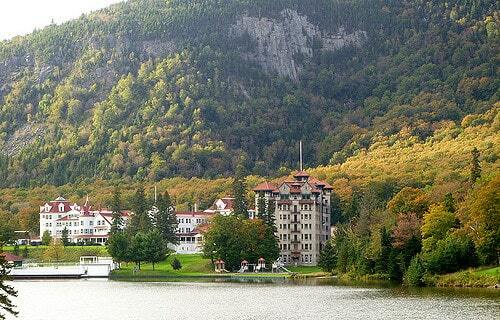 Perhaps most famous as the site of the first voting in the nation’s first presidential primary election every year, Dixville Notch plays host to the 42nd annual running of the Dixville Half Marathon as summer is giving way to fall, along a route that takes runners from this tiny northern New Hampshire village west to nearby Colebrook. Between 100 and 200 runners make the 13.1-mile trek from Dixville to Colebrook each September — plus a number of two-person relay teams, on a day that usually coincides with the peak of the fall foliage season here in what is known as the Great North Woods region of New Hampshire, a sparsely populated region at the northern tip of the state that is known for its beautifully scenic drives like the Connecticut River Byway and the Woodland Heritage Trail. In 2012, runners started the race at Coleman State Park, which lies just north of Route 26 on Diamond Pond Road in Stewartstown, the main road along which runners will make their way westward toward Colebrook for much of the race. The race starting time is 10:30 AM for both individual runners and the first-leg runners of the two-person relay teams, who then head south on Diamond Pond Road. They turn right and head westbound on Route 26, along the Mohawk River, and follow into the town of Colebrook. Once they reach the roadway on Route 26 — about 5.3 miles into the race — runners then begin a stretch that will keep them on this road for nearly the next 7 miles, winding westward all the way into Colebrook to the finish line at the North Country Community Recreation Center, which will end at the bottom of the hill on Lynch Road. Along the way, the course offers up mile after mile of a mostly very gradual downhill descent through the countryside here in the Great North Woods, with stretches through the forests alternating with views of farm fields, barns and pastoral scenes on either side of the road. The course will drop by about 1,200 feet in elevation over the 13.1 miles between Coleman State Park and Colebrook, and the last mile or so in to the finish line will be almost completely flat, winding through town streets. For this year only, the course for the race will not be USATF-certified, and the half marathon relay is open to teams of two or four runners — in the four-person relay, the first leg of the half marathon is 4.1 miles, followed by 3-mile legs for the other relay team members; in the two-person relay, the first leg is 7.1 miles followed by a second leg of 6 miles. The event also hosts a 3-mile fun walk that starts and finishes at the North Country Community Recreation Center. Located near the northern end of the state along New Hampshire-Vermont border, just over 10 miles east of the starting line in Dixville Notch, Colebrook typically sees September temperatures that average between 44°F and 66°F, while rainfall totals average just over 3.7 inches for the month. On the day of the race (Sept. 29), the average low is 41°F and the average high is 63°F. See the race route map for the Dixville Half Marathon here. To reserve your spot in the 2018 running of Colebrook’s Dixville Half Marathon or Relay race, visit the event website here. Ever run in the Dixville Half Marathon? Share your impressions here, or post your review in the Comments below.